In the Distance (2009) with display stand. 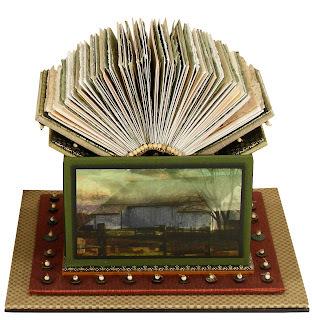 Eugenie Torgerson is an award-winning book artist, photographer, printer, and illustrator from Niles, Michigan. She's been repped by art galleries across the country, and her work is found in many corporate collections. 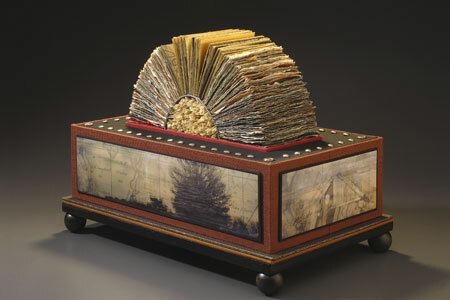 Of her work she writes, "I build book and box forms with traditional bookbinding materials and methods. These sculptural objects contain my own pastel drawings and imagery generated from my own photographs. The stories they tell are contained in my words and the poetry of Kevin McCur. My subjects are the allure of the horizon, the power of the land, the experience of loss, and the sweetness of redemption." In the Distance - Book. In the Distance - Box. In the Distance is comprised of three individual parts: A small illustrated book with short poems that rests open within a cradle on a box stand that houses the whole, designed and produced using Ms. Torgerson's art, photography, and writing. The book is 3 inches wide x 4 inches tall x 3.5 inches thick. The poems are printed on vellum paper and coated with shellac, and the images are printed on various interesting papers. The book is bound in silver cloth with silver metal medallions on the front and back, and black and white beads around the edges. 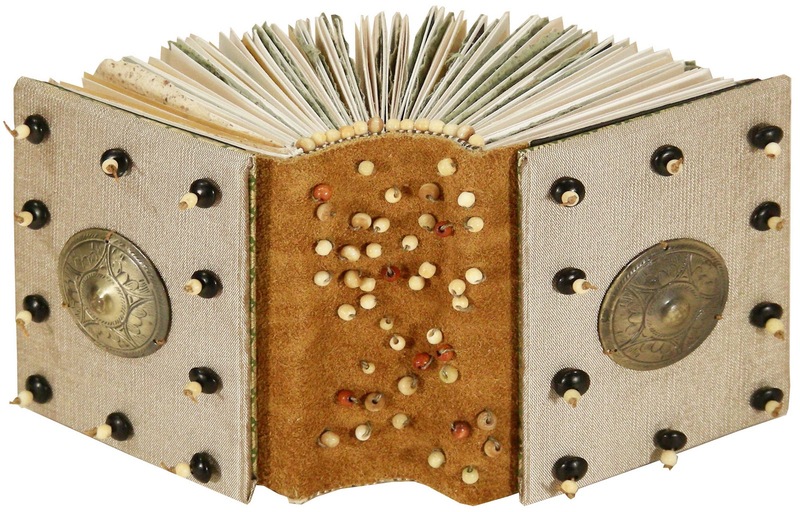 The spine is of brown suede and also has small beads sewn on. The box stand is 5 inches tall and 9 x 10 inches at the base, and the cradle is covered in green/gold cloth and decorated paper. There are the same small bead which are seen on the book cover, and there is also a medallion in the middle. 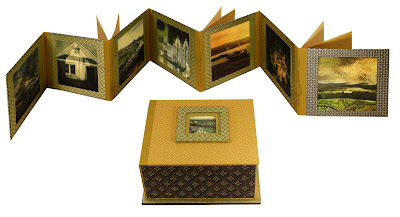 The sides of the box possess evocative landscape images which are printed on Yupo synthetic material and waxed. The box base has two levels, one covered in orange cloth and the other with cloth with a gold and black design. The cover is 8 inches x 9 inches x 9 inches., and each side, too, is covered in brown cloth and has a landscape image printed on Yupo synthetic material and waxed. It has a window on top which allows one to look at the book. Includes custom acrylic display case & base. In From One Place to Another the arch of pages contains landscape images and poetry of migration and settlement. The images on the side panels illustrate homesteads and maps. Compass Book - North speaks to the northern compass point. It is thoroughly white and tightly contained. The images on the side panels are devised from ice, white linen, and sheep’s wool. 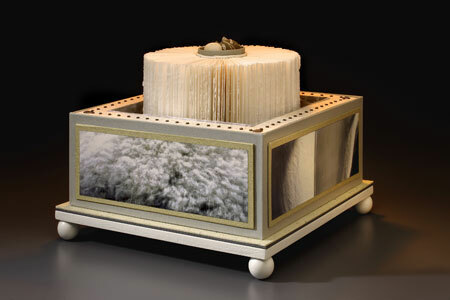 The ring of white pages both asks to be touched and forbids contact because of its purity. A Key to the Map. A Key to the Map is an accordion-format illustrated book with short poems that rests in a footed drop-spine box. The box is 6 inches x 7 inches x 3.75 inches tall and is covered with decorated papers and a gold linen spine. At the top is an image of water printed on Yupo synthetic material and waxed. It is within a frame of gold and green patterned paper with an olive green mat. 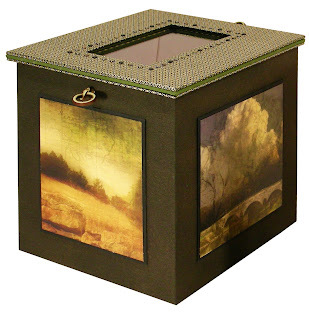 When the box is opened a green cloth lid is found, and a small gold loop allows for raising it from the box. Beneath is the book of poetry. One side opens with the two pages of the poem bound between paper covered boards. There are two more sections containing the remainder of the poem, which is printed on Epson paper and back-coated with shellac. Opening the book on the other side one discovers haunting and evocative images on each side of each board. The images are also printed on Epson paper. The book is held closed with a silk band, long thin cord, and a button. With thanks to The Kelmscott Bookshop for their assistance, and for providing images of In the Distance and A Key to the Map, which they are currently offering. Images of From One Place to Another and Compass Book - North courtesy of Eugenie Torgerson, with our thanks. Wowza! What a stunning display!